Is the monster man fish... or devil? Find out when the 1971 cult horror comes to high-definition in February. 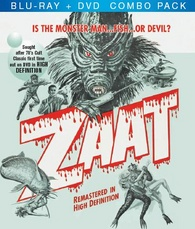 Filmjax is reporting that Cultrare Video is working on 'Zaat' for Blu-ray on February 21. The film about a Nazi scientist who turns himself into a catfish monster has been newly mastered from the original negative and will be one of the flagship titles in the Cultrare label. Specs have yet to be revealed, but the release will be a Blu-ray/DVD combo pack with a suggested list price of $19.98. You can find the latest specs for 'Zaat' linked from our Blu-ray Release Schedule, where it's indexed under February 21.